What if you would have the chance to follow the Apollo 8 mission to the Moon in your Christmas 1968 holiday break through Twitter? Philip Gibson transformed actual astronaut recollections, NASA transcripts of the communications between Mission Control and the Apollo capsule throughout the journey, broadcasts of the main TV networks and pictures shot by the astronauts, as if you just watch your timeline in TweetDeck filtered for #Apollo8. 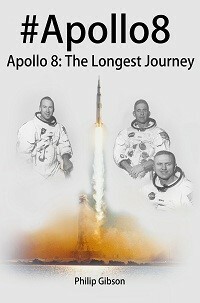 The result is a very readable #Apollo8: Apollo 8 – The Longest Journey that keeps you as close to your smartphone or laptop nowadays, as the interested audience all over the world, from the U.S. and Europe to the controlled press in Space Race competitor Soviet-Union were watching television or listening to radio broadcasts. Six intense days in December 1968 that marked a milestone in John F. Kennedy’s assignment to America to bring people to and from the Moon before the 60’s were over. From the countdown procedures, the massive Saturn V rocket lift off, the wild ride through the atmosphere, and the passage of the Van Allen belts of radiation between the Earth and the Moon. Meet Bill Anders, Jim Lovell and Frank Borman in their finest hours. Both technical details, navigation through space as well as the personal ups and downs, such as commander Frank Borman’s diarrhea, the lack of sleep and the long-johns the astronauts are wearing. All brought to you in tweets, which make it easy to determine who says what. Notable interruptions are embedded as well, by commentators on tv, experts and scientists, as well as laypeople that care concerned about the separation between Church and State upon the astronauts citing from Genesis 1 on Christmas Day. Three astronauts that were the first to orbit the Moon, name Moon craters after themselves, have a look at possible landing zones and show an incredible love for both the Moon and Earth. You’ll keep reading every orbit including loss of signals when above the far side of the Moon, the re-entry at incredible speed into the atmosphere and the nighttime splashdown in and recovery of a spacecraft from the Pacific Ocean. There is an extensive list of major sources at the end of the book. Philip Gibson is a retired teacher of English, having taught and lived in (in order): England, Spain, Saudi Arabia, Thailand, Hong Kong, Japan and Laos. He came to Laos 22 years ago, married a Lao lady and now lives with his wife and two teenage boys on his small farm on the forested banks of the Nam Ngum River (tributary of the Mekong) about 25 miles from the capital city of Vientiane. More Hashtag Histories books are in the pipeline. If you would like to receive an email notification of new releases, please go to the website and sign up at: www.hashtaghistories.com.